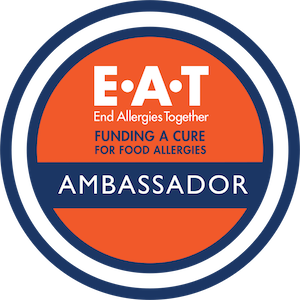 EAT is proud to partner with key influencers to help spread the word on our mission to end food allergies. Each one is personally impacted, as all of us are at EAT, doing important work in the community and we’d like to share them with you. We believe we can achieve great results by harnessing our passion and working together. Chelsey is a New York City based registered dietitian with a virtual private practice helping individuals feel their absolute best by answering the question “What should I eat?” When Chelsey is not helping clients, she is developing tasty, food-allergy friendly recipes, and photographing every bite for her healthy food blog, CitNutritionally.com! Chelsey personally manages peanut, tree-nut and sesame allergies and created an ebook with recipes free from the top 8 allergens. Amanda Orlando is the author and photographer of two cookbooks; Allergen-Free Desserts (Skyhorse, 2015) and Everyone’s Welcome (Touchwood Editions, 2019). She writes about her real and unfiltered experiences living with food allergies, and shares recipes, and articles from guest bloggers on Everyday Allergen-Free. She recently launched an online shop called Handled With Care, selling allergy-friendly food, skincare, and cosmetics. Amanda lives in Toronto. 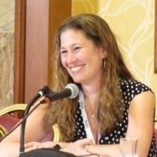 Jenny Sprague is the founder of FABlogCon LLC; A Las Vegas based company for the annual Food Allergy Bloggers Conference; a 2 1/2 day event hosts lectures, sponsors, bloggers, authors and more. Jenny is the mom of two boys who have multiple food allergies and health issues. She blogs about this at Multiple Food Allergy Help. Jenny is a featured blogger on The Best Ever You Network, FAACT, and was featured on Prevention Magazine Inspired Bites in an interview by Robyn O’Brien. She is also a BlogHer Food featured Speaker. She is featured in MediaPlanet’s print and online versions of Asthma & Allergy News, and featured by Allergic Living Magazine as an Allergy Advocate. Stacey, EAT’s former Midwest Regional Director, most recently helped conceptualize and coordinate the inaugural Midwest Food Allergy Conference for Education and Science (FACES), hosted by the Science & Outcomes of Allergy & Asthma Research (SOAAR) Program at Northwestern Medicine/Lurie Children’s Hospital in Chicago. Shortly after her youngest child was diagnosed with a food allergy, she turned her attention to advocacy and outreach by launching the popular Facebook support group for patients and parents, Food Allergy Treatment Talk. Through this, Stacey became passionate about food allergy research and the search for a cure. She earned a B.A. in Communication Arts from University of Wisconsin, Madison. J.J., author of The Land of NOT, a children’s book, is a college senior at The Wharton School living with life-threatening food allergies. He created the Land of CAN blog two reasons: 1) to create an authentic resource for parents of children with food allergies and 2) to strengthen the emotional well-being of young people by empowering them to define themselves by who they are and who they can be, instead of by who they’re not! There he shares his raw thoughts and daily contribution to the nationwide discussion about allergies and our kids. 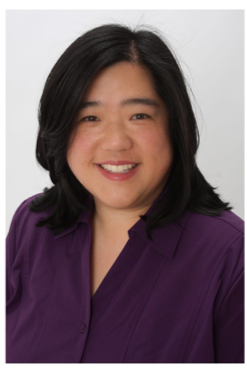 Sharon is a mom, advocate, and blogger at Nut Free Wok, where she writes about recipes, cooking techniques, Asian ingredients, and food allergy related awareness and advocacy issues. She lives in the San Francisco Bay Area with her husband and two sons. Her goal is to make a difference on behalf of those living with food allergies so our children will grow up in a world with greater awareness, support, and a cure.